She didn’t understand but at least I was able to keep putting the train up under the Christmas tree every year which kept her from secretly packing it up and giving it away as she did with many of my childhood toys and dolls. I was unaware that there was a career field called engineering and perhaps if I had known, I would have had an alternative in deciding to change majors in college. Engineering was an exclusive field that didn’t make it into the conversations or presentations in my high school. Perhaps the boys in the Physics class, an upper class elective, knew about engineering. The rest of us, however, were left aspiring to be doctors, lawyers, police officers, firemen, nurses, accountants, and other professions that we had been exposed to in elementary school and in our homes. I can’t remember ever hearing anyone talk about engineering in career day talks, college fairs, or in my high school counselor’s office. My mother worked for Delta Airlines. She wasn’t a mechanic, or an aeronautical engineer. She worked the public side of the airline industry. I never thought to ask her about the other side of the business and in her career day talks, I wonder if any students ever asked her about becoming a pilot, an airplane engine mechanic, or a designer of commercial aircraft. Fast forward thirty years. In 1993, Congressman Louis Stokes of Cleveland, Ohio, concerned that minority students weren’t pursuing science and mathematics, worked with NASA’s Lewis Research Center and Cuyahoga Community College to create SEMAA (Science, Engineering, Mathematics, and Aerospace Academy). SEMMA was a STEM program at a time when nobody was calling science and mathematics STEM. The Internet was still a text based network with no images or color. Technology was computer science and Basic and Fortran were the programming languages being taught. Engineering, alas, was still not in the picture in most career awareness presentations. By the mid 2000’s, STEM started becoming the new buzz word. Unfortunately, as with all buzz words, many people and organizations, even many educational institutions, did not know how to properly implement STEM. I’ve judged science fairs that are now called STEM fairs where student projects had no engineering component in them anywhere. Now fast forward another twenty one years. As STEM has moved from an acronym that in 1993 was an obscure term used to encourage underrepresented and under-served populations to look at and become engaged in science and math in new, more engaging ways to stop that, “I hate math, I hate science,” mentality because “It’s hard,” into making STEM fun, exciting, interesting, imaginative, and purposeful. My question to everyone out there who has turned their science programming into STEM programming is, “Is it purposeful?” Are you working towards an end goal that will really inspire young people to WANT to go to college and major in a STEM career field and graduate then pursue a STEM career or are you just capitalizing on the acronym to gain funding, media attention, and student participation that costs parents and a year or two later those students are playing soccer, joining cheerleading and pom-pon squads, playing basketball, or involving themselves in other activities that are far removed from anything science, technology, mathematical, or technologically relevant. This is why, forty-five years after the United States landed on the Moon, we still have a huge shortage of qualified individuals in this country to fill the thousands of engineering jobs that are available. 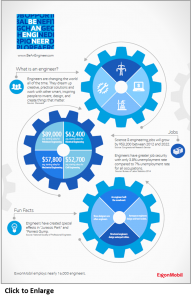 Here is a blog post from Exon Mobile explaining why we need engineers. Let’s hope it doesn’t take us another forty-five years before we take the need to inspire and engage our youth to pursue engineering as a career. To help address this predicament, ExxonMobil has launched a nationwide initiative seeking to inspire the next generation of engineers. Our Be an Engineer campaign aims to highlight the meaningful contributions that engineers make to the world, as well as provide resources to assist young people interested in pursuing the profession. In the weeks and months ahead we’ll be running a number of commercials on television in support of this effort. You can catch them at ExxonMobil’s YouTube channel as well.